Athlete, educator and community leader, Barbara Howard was the first black female athlete to represent Canada in international competition. 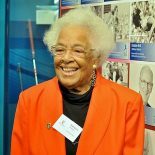 In 1948, when most ethnic minorities were barred from teaching, Barbara became the first person of colour to be hired as an educator by the Vancouver School Board, teaching physical education at Lord Strathcona Elementary School. In 1938, in grade 11, Barbara ran a 100‑yard sprint in 11.2 seconds to qualify for the British Empire Games, a time that beat the games’ record by a tenth of a second. But despite winning silver and bronze medals in relays at the games, she came sixth in the 100‑yard dash. Her next chance would have been the 1940 Summer Olympics in Tokyo, but the Second World War derailed the Olympics for the next decade and ended Barbara’s running career. In 2010, Barbara was recognized by the Vancouver Park Board with a Remarkable Women Award for “her passionate dedication to inspire others to make a positive difference in their community.” She was inducted into both the Burnaby Sports Hall of Fame and the BC Sports Hall of Fame, and in 2013, received the Queen Elizabeth II Diamond Jubilee Medal. In 2015, she was welcomed as one of “The Legends” in the Canada Sports Hall of Fame. Barbara Howard passed away on January 26, 2017 at the age of 96.